P104-DAQ1616 is a PC/104-Plus data acquisition I/O card integrating Diamond's newest and fastest analog I/O technology and a PCI Express interface. Diamond's exclusive Universal Driver Software is included at no charge along with the P104-DAQ1616 I/O module It provides a high-level programming library for all of our I/O boards, as well as for the data acquisition circuitry on our SBCs and Embedded-Ready Subsystems. All data acquisition features are supported by easy-to-use function calls, resulting in a reduced learning curve and shortened application development time. 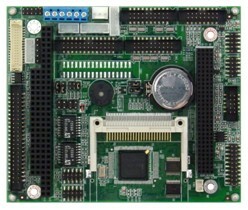 The Universal Driver works with Linux and Windows XP. Application examples and projects are included for each function, each board, and each operating system, in order to provide a quick starting point for learning and development. Learn more about our Universal Driver software here.